Neither Bill nor I are fans of cold weather. He grew up in Chicago, and I grew up in eastern/central Nebraska, and we both have spent the majority of our lives in Colorado, so it’s not like we aren’t used to wearing snow boots that track the snow into the house, and knit hats that flatten your hair, and heavy gloves that make you incredibly clumsy. But it doesn’t mean we have to like it. And we don’t. That is why we own a house in Mesa, AZ; it’s someplace to go when the snow begins to fly. 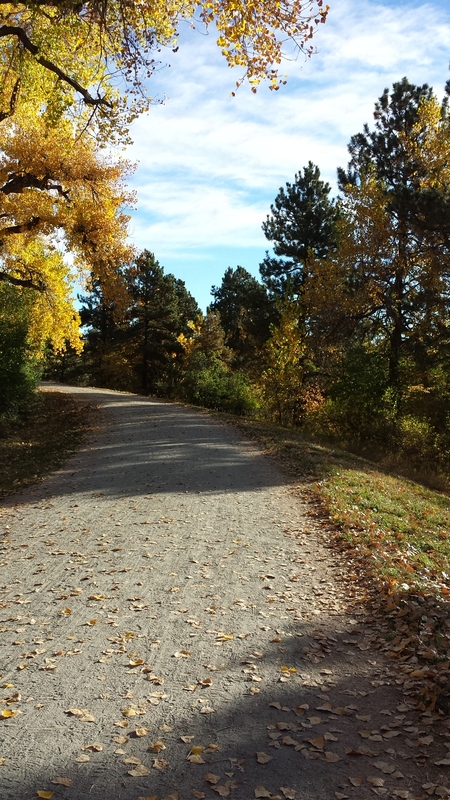 Having said that, I really do love the fall days in Colorado. And I love them even more because, despite the fact that the changing leaves are a precursor for the inevitable snow, I can thumb my nose at it. We leave next week for Arizona. Let the snow fly. This year, unfortunately, I don’t see us getting up to Rocky Mountain National Park to listen to the elk bugle. That makes me sad because it’s one of my very favorite things to do. For a variety of reasons, we can’t make that work this year. Nor have we been able to find time for even a drive in the mountains to look at the changing aspens. That bright gold against the evergreen trees, both juxtapositioned against the blue of the sky, says autumn to me. 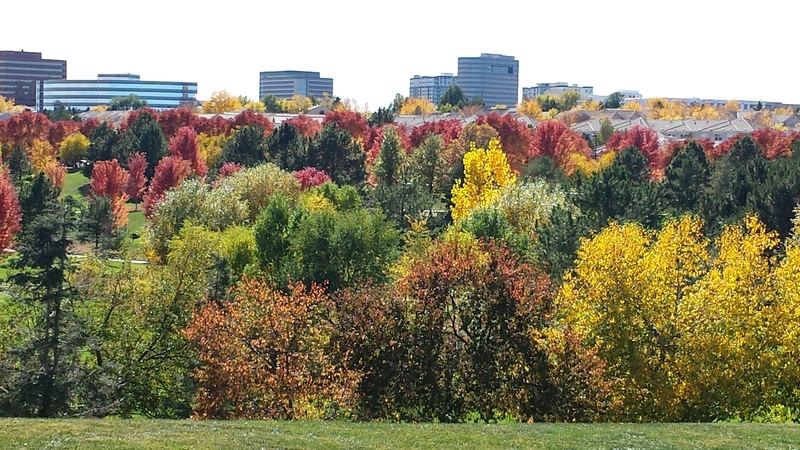 But it hasn’t mattered because the trees here in Denver have been absolutely splendid. Magnificent. A gift from God. I have never properly seen the changing leaves in New England. One year, when I was still getting paid to write, I attended a conference in Boston in October. Bill accompanied me as the guest spouse as he often did. After the completion of the conference, he and I took a week-long drive to see the changing leaves for which the region was famous. Only they weren’t. Changing, that is. I frankly can’t remember if we were too early or too late, but it doesn’t matter. There were the trees, either still bearing their green leaves or standing naked. But not red and orange. We drove through Rhode Island and Delaware and Vermont and Maine and Connecticut, and the trees simply didn’t cooperate. Not a red maple leaf to be found. 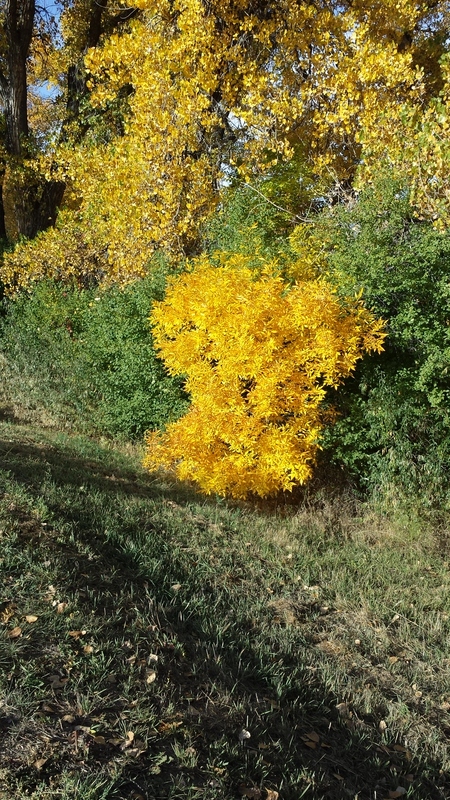 I’m sure New England’s colors are magnificent, but frankly, the colors in Colorado this year have been incredible, even without a trip into the mountains. The parks have ash trees and maple trees and oak trees and honey locusts, all proudly displaying their colors. The scrub oak are getting into the action as they turn to rust. 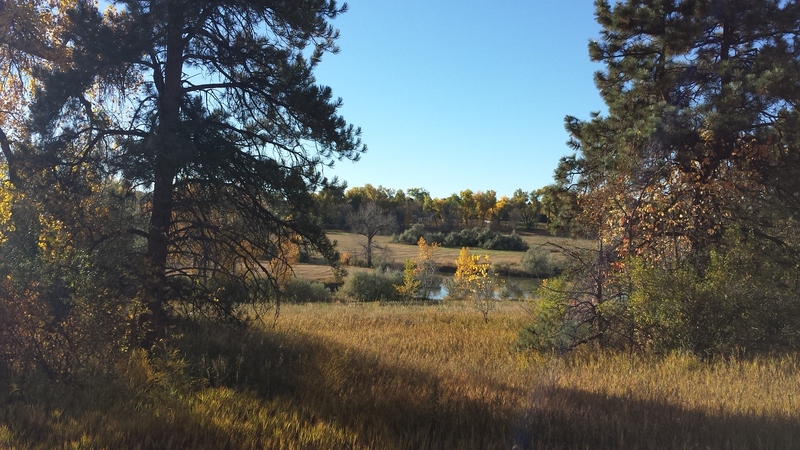 I have made it a point to get out and enjoy the colors, and here are some of what I’ve seen……. I know these photos look like I’ve been in the mountains, but all of the photos were taken smack dab in the middle of Denver at urban parks. Aren’t I lucky? 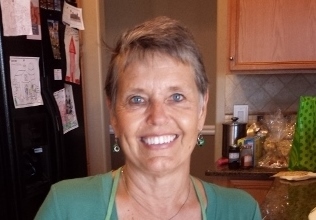 Jen reminded me recently that when she and Bill and I first bought the house in Arizona, Bill and I would leave late in September and spend nearly all of October in Arizona. She told me she always was sad that I was missing the pretty colors. October is the nicest month of the year, she proclaims. And I think she’s right. By time Bill and I return to Denver for the holidays, the trees will be bare and snow will have fallen. In fact, despite our attempts to live a snowless life, we always get a snowstorm or two sometime between Thanksgiving and Christmas Day, when we leave again to spend the rest of the winter in AZ. That’s okay. It reminds us of our youth. Plus, now we have grandkids to do the shoveling! 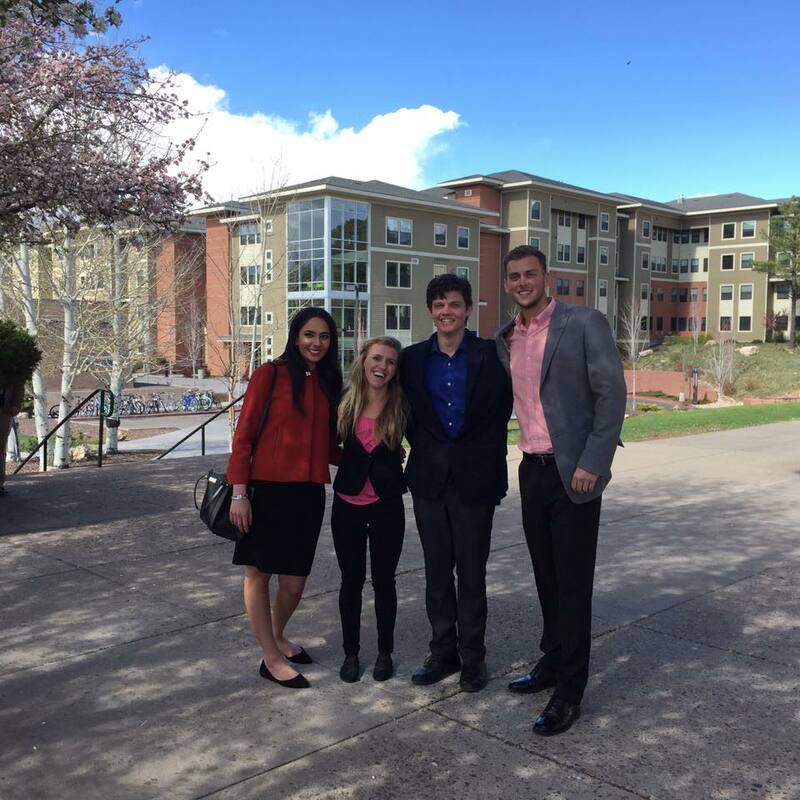 Jessie, second from the left with her Capstone Project group, is still and always, little. When my niece Jessie was a little girl (well, arguably, she’s still a little girl, though in her 20s. A good wind could blow her away.) 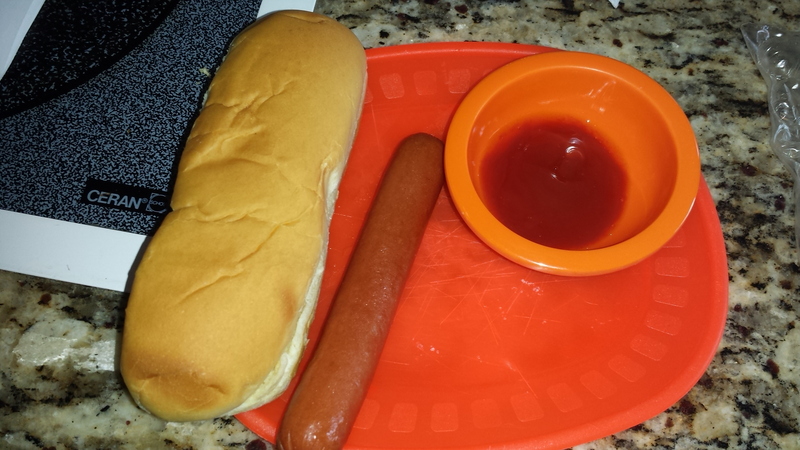 Anyhoo, when asked what she wanted for lunch, she might say a plain hotdog. In fact, the first time she asked me for a plain hotdog, I — quite reasonably, I think — placed a weiner into a bun and handed it to her. No ketchup or mustard. No onions or pickle relish or chili. A weiner and a bun. No, I want a plain hotdog, she said firmly. I eventually came to understand that for her, a plain hotdog meant a hotdog bun. Period. No weiner. No ketchup. No mustard. A bun. This is the same girl who, along with her sister Kacy, would go through the salad bar and place croutons on the plate, douse the croutons with ranch dressing and call it a salad. Like bread much? I thought about this recently as I served Cole a hot dog in his preferred style…..
September is perhaps my favorite month of the year. I like that the days are still warm, but nights start to cool off. I like that I can without guilt give up on my flowers and let them play out until they give up the goat. I like the changing leaves. 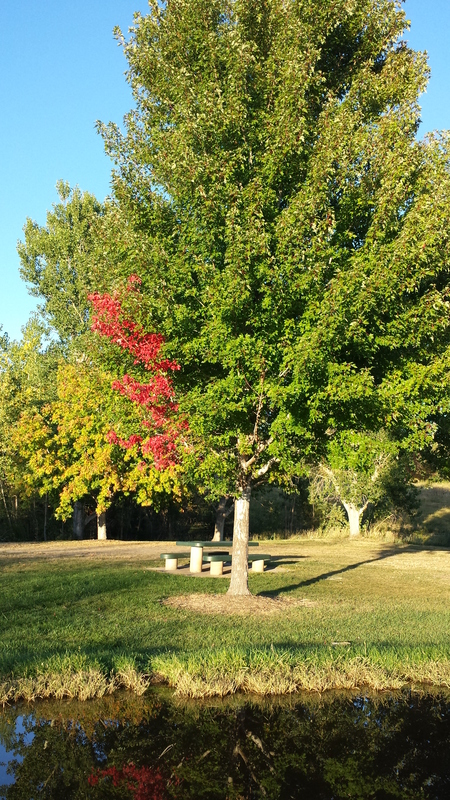 I was recently at a nearby park and saw this beautiful maple tree that is just starting to turn…..
And yet, I find that the fall has a bit of a melancholy feel to it. Perhaps it’s the flip side of all of those things that I just listed that I like. Click on this link and tell me if Nat King Cole doesn’t make you tear up. My sister Jen and I recently had a conversation about a woman she knows who, she said, is perhaps the worst dishwasher loader ever. This is in contrast to my daughter-in-law Alyx, who can load a dishwasher so efficiently that I think she could make it hold every dish I own. 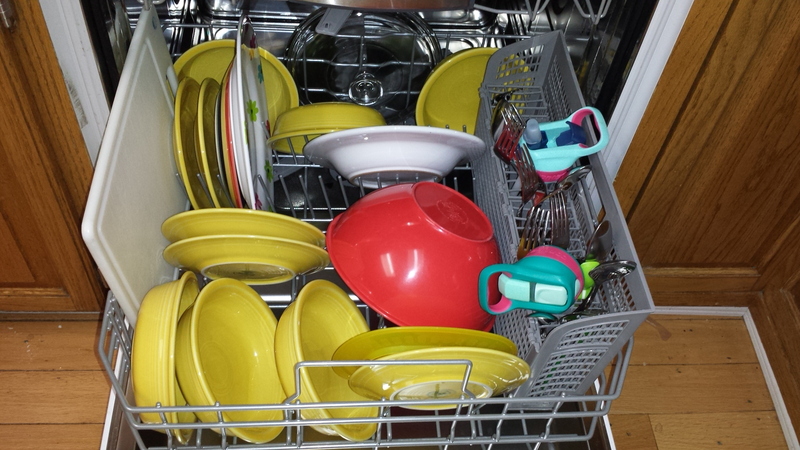 Unfortunately, here is a picture I took of the dishwasher after I loaded it recently. I’m not proud of it, my friends….. I had lunch the other day, and as usual, paid for it with my credit card with no problems. However, as I walked to my car, I got a text message that indicated my credit card (they named the bank that issued it) had a problem, and requested that I call the toll-free number provided. Since I had just used the card, I felt that it was reasonable that there really could be a problem. I was just about to press the number they provided, when I heard (in my head) my husband’s voice saying, “Never assume the number they give in a text or email is safe. Instead, always call the number on the card. And so I did. And I learned that there wasn’t a thing wrong with my card. The customer service representative complimented me on being a wise consumer, and told me the text was undoubtedly phishing. Not only am I proud of myself for not falling for their dirty tricks, I’m also proud that I know the correct way to spell p-h-i-s-h. Don’t mess with me, tricksters. I wasn’t born yesterday. And now, if you’ll excuse me, there is a Nigerian prince who has asked for my help.